(January 18, 2008) The CESPOC library announces the purchase of what many believe to be the rarest comic with a vampire story. The so called Captain America Annual 1943 (or 1942) is in fact a 132-page book published under the simple title Captain America Comics. The publisher was indicated as Universal Crime Stories Inc. (rather than Timely) and, although copyrighted for both U.S. and Canada, it was probably distributed only in Canada. According to Stephen H. Gentner, it “was very likely that not many sold and damn fewer survived. Estimates range from 10-15 copies extant, and Ernie Gerber gives it an ‘8’ out of 10 scarcity. And the book is such a ‘chunk’ anyway. World's Best #1 is only 100 pages, and it is huge! The Cap Annual packs a whopping 132 pages-two 64 page books plus 4 cover pages! The format is notable too. It was published with ‘extra width,’ is squarebound, and has ‘regular cover stock’ paper (thinner than usual) rather than the "cardboard" style covers of other early Golden Age Annuals. All this makes for a book that is quite fragile in the hand, vulnerable in a stack, and victim #1 in storage! And all that adds up to a book that is an exception of survival!” (“The Mystery of the Cap Annual: A look at one of the rarest and most collectible Timely oddities ever published!”, Comic Book Marketplace, June 1998). As the same source noticed, “the contents are black and white, and are the complete interiors of Marvel Mystery #33 and then Captain America #18.Squarebound, the covers are blank inside as is the back cover. 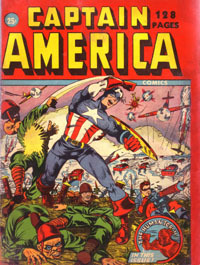 The cover itself is the same as Captain America #22drawn by Syd Shores”. CESPOC is glad to add it to its collection of pre-code comics with vampire stories. It includes, in fact, the story “Captain America and the Tomb of Horror” by Otto Binder & Al Avison (12p.) from Captain America #18 (Sept. 1942), which features vampires. Rare items from the CESPOC collection are kept in a bank vault and may be examined by serious scholars by appointment only.